Encouraging home-based businesses as a sector is a smart move in any economy, but for the Jamaican economy it is even more important as we pull out of this recession and into a period of recovery and growth. The contribution of this sector to economies of developed countries around the world has been very significant. Both the Home-Based Institute and the Small Business Administration in the United States of America have shared statistics that can better help to inform us as to the home-based business opportunity market sector as a whole. The Home-Based Institutes believes that home-based businesses contributes approximately US$427 billion annually to the US economy, while generating 8500 job opportunities on a daily basis. At the same time the Small Business Administration is of the opinion that 53% of the small businesses located in America are home-based, with an average annual income of US$63,000 per year. This information is very useful to us as a country. When we examine the problems the country is faced with: our spiralling debt, our high crime rate, problems with urbanization and lack of productivity as well as our number one problem of unemployment, Home-Based Businesses could really be the way forward for the our economy. It is easy for us to dismiss the thought of encouraging home-based businesses as a sector, because to many, home-based businesses are just small meaningless start-ups that will not last. The technological, environmental, demographic and financial changes of the last ten years have been significant and have taught us that the only constant in life is change. We are now seeing where home-based businesses are having a higher success rate of surviving beyond three (3) years compared to traditional small businesses. Lower operating cost, increased productivity. Flexible working hours, freedom administrative control. Location, reduction of stress, more time with family. The electronic office, greater individual earning potential. Large corporations have also used this concept to increase their productivity, with different companies registering increases in productivity between 10 and 35% among their employees who work from home. Yes, the home-based business concept is for large organisations too. According to a December 2010 issue of the Harvard Business Review Magazine, IBM has 40% of their staff working from home on any given day. Great softwares from companies like NesterSoft, producers of the Worktime (a project and time management software), an employer can track the hours that an employee spend on different task and help them manage their time more efficiently. Employees who reside in Portmore St. Catherine are prime candidates for such a pilot project. Here an employer can increase the productivity and morale of his/her employees who lives in this municipality. If a Portmore resident should check the hours spent sometimes in traffic during his/her commute to and from work, one would see the amount of productive time wasted on a daily basis. Jamaica can no longer afford this. Some of these very tasks can be done remotely. 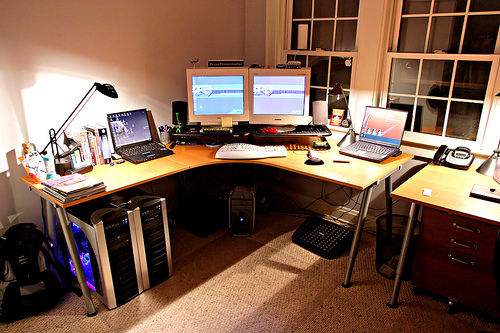 With a properly working computer, reliable internet service and the right softwares etc, employees could work from home. This is a win-win situation for all the stakeholders (employers, employees and the government) involved. Companies will benefit from less sick and personal leave taken, lower turnover, which cuts hiring and training cost; reduced office and parking space needs; and increased employee productivity and morale. Motivated and responsible Employees usually put in more work hours because they have more time by not sitting in traffic or because they have fewer distractions. Also working from home can help create more jobs for the disabled and persons who live in rural communities. While for the country, more productivity means more earnings, thus more taxes. I could continue with numerous statistics from the U.S Bureau of Labor Statistics, the U.S Census, Office of Advocacy Small Business Administration and many more institutions around the world, to support the call for more emphasis to be placed on developing a home-based business sector, that could address Jamaica’s problems, but first our mindset must change. One of the largest obstacles in introducing/promoting this concept to Jamaica is that it requires a paradigm shift in businesses, employees and policy-makers. A paradigm shift that will see more of our over 2000 university graduates per year, young people engaged in crime and our well experienced retirees start their own home-based businesses. In conclusion, the promotion of telecommuting/home based businesses presents an interesting and exciting prospect for individuals, corporations, government and the local economy as a whole. Not only will employment be increased, but productivity, economic and social benefits will abound to the larger Jamaican society.